Those who live in the Midwest have the lovely chore of changing out there closets for the season. I hate seeing summer clothes when it's 50 degrees out. I don't like changing out my clothes but like most chores once it's done its a great feeling! My goal is to live with less and gain less stress. 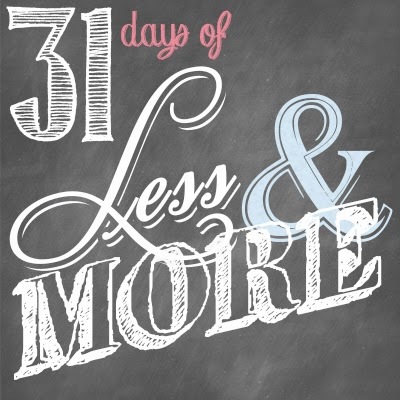 I've been doing a 31 day challenge with this great blog called Living Well Spending Less: 31-days-of-less . I'm excited to do this challenge because I will be done a week before Thanksgiving and I love to give my home a good Spring Cleaning before the Holidays. This also has some spiritual cleaning as well.....I take it or leave it since I'm a little emotional right now with a baby on board.....but it is good and it's not too deep or overwhelming. So I wanted to share with you my little closet. Changing out my closet really goes pretty fast. I have a trash bag for worn out or stained clothes. I have a trash bag for donations for clothes: I didn't wear that year, too big or too small, out of style, or I'm just sick of. This year I added emotional clothing, like clothes that has your name on them or your husbands T that is so comfy but really needs to be trashed. So this is what my closet looks like now. Sorry I didn't get a before pic, I just went for it and didn't take the time to snap a pic. You know how it is with kids you just sometimes do when the time is available. I counted the hangers and I had about 40 pieces of clothing and I really think I can live with 50. For some that might be impossible. Right now I live a pretty simple fashion life. I'm a stay at home mom I don't have a work wardrobe and I just dress simply. I wouldn't call myself a fashion person. I personally don't like how much it changes and trends, it drives me crazy. I want to put something on that is simple, comfortable and pretty. So for people who love fashion this may be impossible. I keep my shoes in this little hanging thing. I love that it keeps my shoes off the floor. I hate a closet with a bunch of tossed shoes. I also like that it limits me to how many shoes I have. I live by the rule: if I buy something new something needs to be tossed. I need to actually go threw and put my sandals away for the winter. I keep my T's and undershirts on these shelves. It's easy to put away and keeps it organized. If these shelves start to overflow, I know it's time to toss! Call me a cowgirl....I have a few pairs of jeans especially when I'm prego. But I limit myself normally to 5 pairs of jeans. a few more pairs of shoes....I only have one pair of tennis shoes, a couple pairs of winter boots because I do live in Iowa, one pair of dress boots, slippers, and causal everyday shoes. My husband wants to get me one more pair of riding boots and that will be it. I tossed one pair of cowboy boots to make room for my new ones. Accessories are very little in my closet. Black belt, brown belt and a few necklaces and a handful of little hand bags. I want to buy one really good leather purse and like my riding boots I'll wear it for years. It also helps that I'm not into jewelry. I love seeing other woman with it on but for me it's my wedding ring and that's it. I keep my scarfs in my coat closet so I can add a little color to my wardrobe with those. I have 2 bins up high for little gifts for my boys, I even put stocking stuffers for Christmas or gifts I find on sale. I try and not put too much up there for myself because I'm short and it will get lost or not worn. So it's a gift storage for now. Hope you have a great weekend!! We will be working on our mudroom. I'm so excited for it to be done and more importantly used. It's cold and I feel snow in the air and shoes will need to be tossed off and coats hung. The mudroom will be our favorite room the next few months!